The Multiband Converter from Cycle 24 Kits will allow you to receive the 40, 20, 17, 15, and 13 meter bands on an ordinary cb radio and the 80, 49, 40, 20, 15, and 10 meter bands on an am broadcast receiver with no modification to the radio. 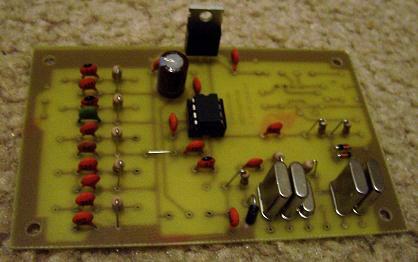 The converters consist of an sa612an, 5 selectable band pass filters, 6 selectable crystals for the local oscillator, a VXO circuit for fine tuning, and a simple transmit protection circuit on the output to protect against accidental "key-ups" when using the converter with a cb or 10 meter radio. I've also included a place on the board for an lm-386 audio amplifier to allow the converter to be used as a direct conversion receiver. All on board parts are included but 2 double pole 6 throw rotary switches will be required for band switching (radio shack part number 275-1386). In lieu of the switches the converter can be hard wired for a single band. Below is a list of the bands covered by the converter. Assembly time for the Multiband Converter should be 1-3 hours depending on how fast you work. The seven page manual includes a schematic, layout diagram, frequency conversion chart, and takes you through the assembly process step by step. The Multiband Converter is US$21.95+$3.00 shipping. Typically orders ship within 3 days however due to limited inventory delays of up to ten days are possible. If you would like to check availability before ordering please contact me via email: support at cycle24kits dot com.